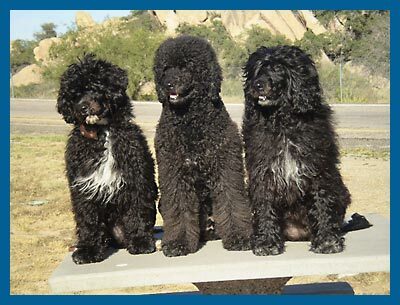 The PWD is a native of Portugal predating other coated water breeds such as the Poodle. In his native Portugal and most European countries the PWD is known as Cao de Agua. It is also believed that very early origins had the PWD related to early herding dogs in Asia. Mine have been known to herd me into the kitchen at meal times. Historically, the Portuguese Water Dog worked for the Portuguese fisherman and was trained to help with carrying messages between boats, dragging the nets out, retrieving gear that went overboard, and  most importantly  guard the boat when in the port. All these traits are still present in the PWD of today: they love retrieving, and carrying things (e.g., toys, pine cones, sticks, and, yes, your shoes) constantly. They love swimming and boat rides; and will guard your house, car or boat without fear. In the US, the AKC classifies the PWD in the Working Group. The FCI standard in Europe calls for the Cao de Agua to be shown in the AKC equivalent of the Sporting Group  a group designated for dogs that retrieve from the water. The PWD standard calls for a highly intelligent, well built, medium sized dog with good substance and substantial bone. There are 2 coat types: wavy and curly. Males are between 20 and 23 inches tall and females between 17 and 21 inches. The breed is described as “spirited and obedient”. Don’t discount the “spirited” portion of the standard when considering this breed for your family.